AssalamAlikum. Dear readers, thanks for joining me in the journey of memorizing surah Annoor. I had to memorize surah an-noor in about a month’s time (5 weeks to be precise) to compete in a contest. By sticking to the plan posted in my last post, I was able to memorize 31 verses out of 64 verses of the surah in less than 2 weeks. I was astonished to see me memorize long verse about hijab (verse 31) with ease! I had found it difficult to recite earlier. Doesn’t it sound great? WOW!! Half of the chapter was in my grasp. A piece of cake! Was it really? That’s just 4 pages of the 10 pages to be memorized. But human mind has ability to see things easy. This is where good things seemed to come to a halt. Why? I had fallen prey to whispers of shaithan. I had been deceived. It is very difficult to reveal the reason.The biggest reason for my downfall is “NAFS” – myself. It’s me who had turnedOVERCONFIDENT. I hadn’t been wise to stick to plan. I had also procrastinated. I was pleased with what I had memorized and didn’t give enough time for quran. Subsequently, everything seemed important. I was scheduling family gatherings and friend’s get together. These seemed like most important things to be done! Whenever I opened annoor, I always remembered something ‘better’ to do and was tempted to do it. Few more minutes with my kids or browsing or reading wasn’t going to change much. Before I could realize the minutes had changed into hours and days. A week flew by and I had not bothered to memorize a line. By that week end, I tried desperately to catch up. Now being nervous nothing seemed to register in my mind. I was convinced I had failed. I was very upset. I was consoledmyself – ‘Atleast I tried. Allah is most merciful’. Ah! This is other type of shaitan’s whisper to keep us from doing our best. There were still 3 weeks to go. It was too early to accept defeat. Now, I decided to keep memorizing. Though not confident, I wanted to see how much I could memorize. I had reached Ayath an-noor. It was a verse worth writing a book upon. It showed state of heart blessed with light of Faith. This more than anything made me question my level of faith. 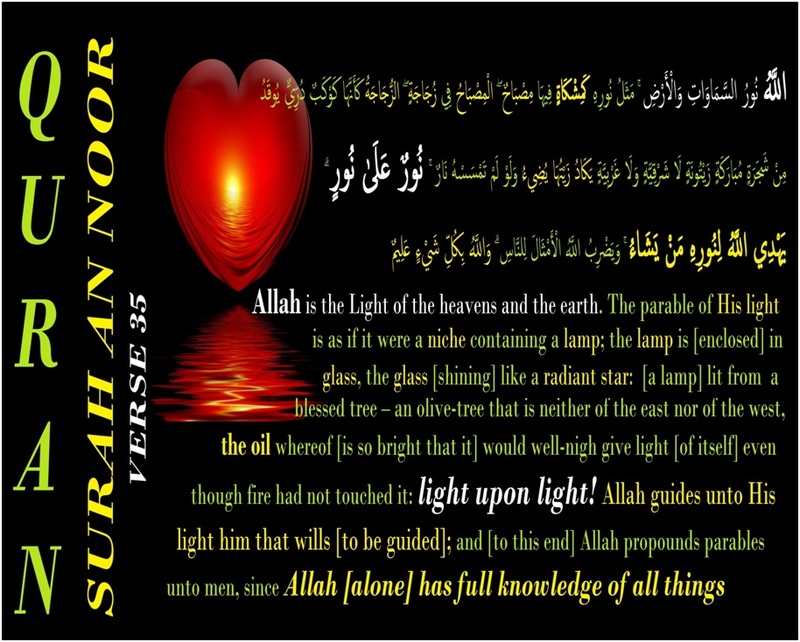 I learnt from tafsir ibn-kathir -The heart of the believer in its purity is like a lamp in transparent and jewel-like glass(well protected), and the Qur’an and Shari`ah by which it is guided are like good, pure, shining oil in which there is no impurity or deviation. Such faith shines through itsactions – It’s Light upon Light. Light of the Qur’an and the light of faith give light when they are combined, and neither can do so without the other. Allah guides whom so ever he wills towards such state. We all aspire for such a heart. Our words and action had to project our heart’s faith.TO IMPLEMENT QURAN WE HAD SPEND MORE TIME WITH IT. DIDN’T WE? I felt guilty on the account of the time I had wasted. Being unhappy with current state, I really wished to make most of the days to come. Then I memorized verses highlighting the state of a disbeliever. The sharp contrast from the state of a believer was evident. 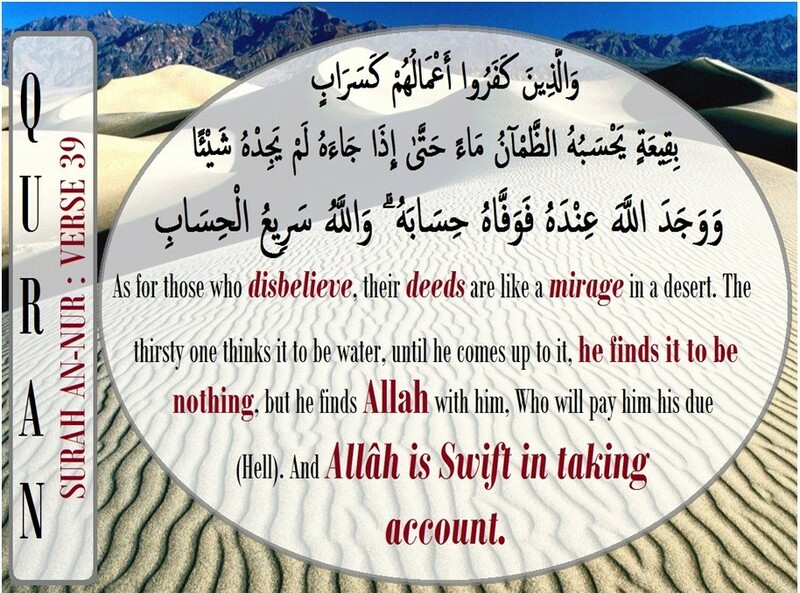 How deluded is a disbeliever’s state; Far from Light (the Guidance from Allah); Lost in darkness. To make it worst, he is in illusion that he is right! His false contentment is nothing more than a mirage. Subahan Allah!! Life is a beautiful gift from Allah. By being connected with Quran we could drench our heart in Light and shine better in Hereafter. Having learnt these lines, I resolved to memorize this surah within the time period. By the end of 3rd week I was left with 4 pages to memorize. This meant I had to memorize 4 pages within a week and spare a week for revising. This was a mammoth task for me. NO EXCUSES: My son’s vaccination was scheduled then. While waiting and travelling normally I would have restricted myself to zikr, but now I was memorizing. I did feel this may appear as a show off. I sought refuge in Allah from such whispers of Shaithan. MINIMIZE: Reduce sleep, food and socialization. When one can give such dedication to work and studies, why not toquran? Once, I slept as I was listening to recitation. I dreamt as though it was raining in my room from roof! I felt drenched and refreshed! The dream was a much needed encouragement. SACRIFICE: Sadly not just me, my whole family had to settle for simpler food and little mess (little more mess to be precise ). In short, it was QURAN 24*7. Alhamdhulilah I had memorized an- noor, a verse at a time. Being a non Arab, I was least confident of ‘Makharij’ (articulations of letters). I decided to seek help from my Arab neighbors. I didn’t seek their help earlier out of fear of annoying them. They were patient and encouraging. Its only when I recited quran loudly to others I was able to see my flaws. Though I had memorized, it took me time to skip from one verse to another. I was blinking like a kid on stage. Sometimes it was necessary for the listener to read translation!Only then, Iwas able to recollect the verse. Yes, I was in bad state. My neighbors belonged to different countries. Our nationalities, mother tongue, skin tone, cuisines and culture were far apart. Yet, we were tied together by Allah through Islam and Quran. Alhamdhulilah. They notified me whenever they were free. Then I rushed to recite to them. Few other neighbors sent my family meals during last week. Rarely, have I been this pampered. Surely, Allah has His way of making things easy for us when we move towards Him.May Allah reward these sisters with best. I love them dearly for sake of Allah. Indeed I am in debt for what they have done. I also recited an-noor to my husband number of times. Frankly, this is more romantic than roses or a candle light dinner. Roses and dinner are great. This was like a precious jewel gifted by my hubby for my ‘Akhirath’. When quran becomes a reason to spend time together, the couple is connected by love of Allah. Could there be a better way to achieve everlasting love? (Working together for a better ranks in Here after)Every muslim family should spend some time together, to reflect upon Quran and Hadith. Insha Allah this would increase love and kindness for one another. Prior to the competition, my recitation was better. Recite quran to someone who has memorized quran or has good command over quran. Reciting memorized portion in salah/tahajud makes lot of difference. Good pious company, clean and quiet place of recitation, Mushaf used play a major part in memorization. I was stunned with what I had accomplished- I had memorized. I earnestly believe anyone, at any age, in any country can memorize and live by Quran as long as one is sincere and consistent in his/her efforts. May Allah make us amidst them. Aameen. For the list of other articles please click here. You have a nice way of writing, alhamdulillaah. I would like say few things here. 1. It is a misunderstanding that the pronunciation of all Arabs is apt or correct. We have many Egyptians and other nationalities in our school, and I know where they stand. To learn proper and correct way of pronunciation, the seeker of the Qur’an, whether Arabic or non-Arabic speaker, must necessarily and compulsorily approach only those who are well-versed in Tajweed and the art of Qur’anic recitation. 2 As you rightly said, without checking one’s pronunciation from an authority, one should not venture to memorize the Surahs. 3. I appreciate your romantic way of life. MashaaAllah, it is so nice to hear that a couple sits together to read, recall and revise the words of Allah. What better thing can be there in this world other than spending time with Kalaamullaah. 4. Keep up your good work and greetings and salam to your beloved hubby as well. Jazak Allahul khair for our feed back. Bless you. You have inspired me to learn Quran now. You even made the struggle sound easy with your dedication. May Allah swt reward you and your family in abundance. MASHA ALLAH, many congrats on this great achievement!! Ohh Subhan Allah Subhan Allah sis…your posts always fill my eyes with tears. Really you have motivated me to learn verses of Quran. How beautifully Allah swt made your path easy. He arranged dinners from your neighbour. He helped your hubby to sit with you. Alhumdulillah. You are really blessed sis that Allah swt has given you such a sweet hubby and really what could be more romantic than this. How is it going so far? I myself I am trying to learn surat al mulk. Congratulations! BarakaAllah feek. The light upon light verse is my favorite too. May Allah reward your effort, dear Haya.